The end of the year approaches and Poker Mutant got in a batch of games the past couple of days. Not exactly good games…. Skated around the starting stack for a dozen hands, then grabbed a few hundred chips only to lose several hundred with the second pair. Got all-in three-way pre-flop with K♠T♠ against 8♥K♦ and Q♦A♣. A 7♥J♥8♦ flop made most of my straight draw but meant I wanted it kept low. T♦ for the turn put me in the lead but made the upper straight draw very bad. The river was Q♥ and knocked me out. Twelve minutes, 22 hands. 3,207th of 4,216 players. 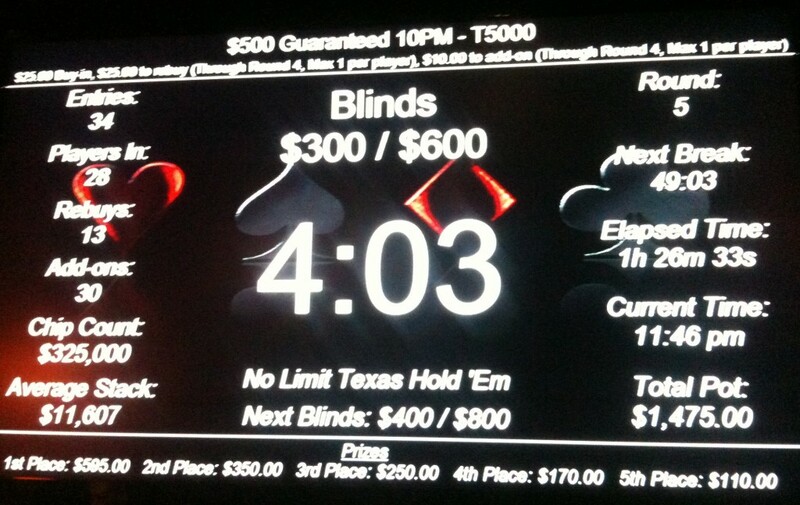 Got off to a good start here in Hold’em in the third hand with K♣T♥ against my nemesis (see above) Q♦A♠. Made a king-high straight on the turn and collected 350 chips. A few hands later my opponent hit bottom two pair on the flop, I had top pair and made another on the turn. 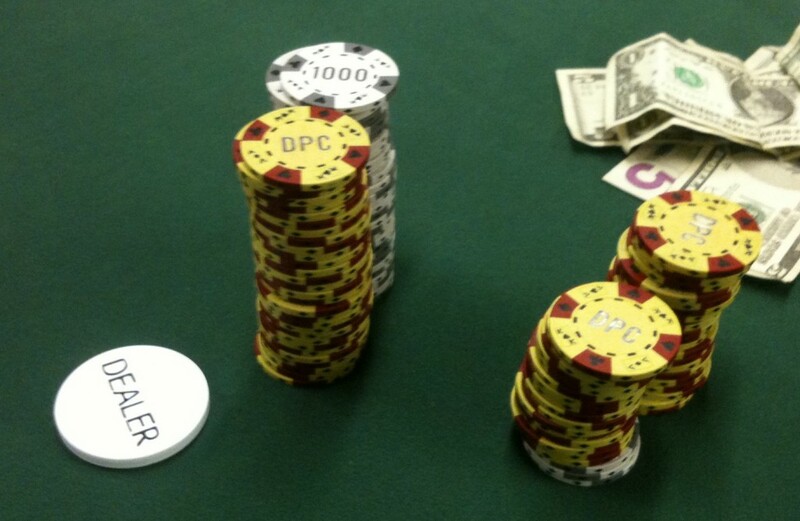 That pot turned into over 1,000 chips. My chip advantage had melted away by the time the first four hands of Omaha8 were over, though, and by the time we started Razz I was down to 525. 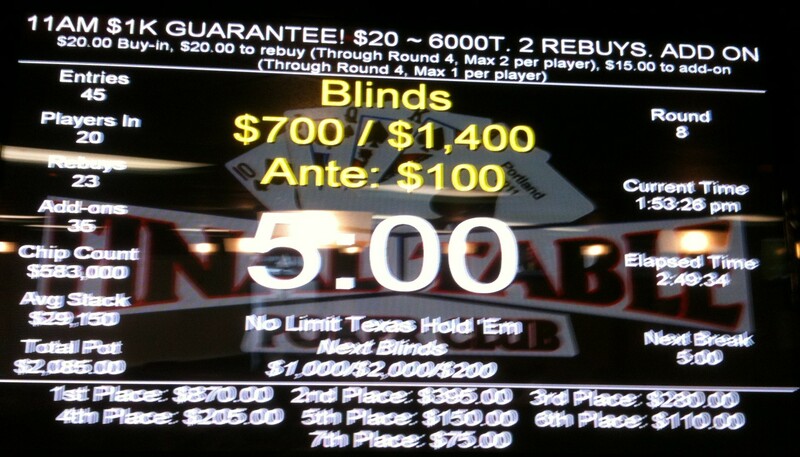 I won small amounts in three hands there but started Stud with only 380 chips and limits at 100/200. There was a completion (A♠ showing) and a call (K♣) ahead of me, I had J♣8♠ down and 8♦ showing. Two of the other jacks were showing. J♠ called after me, and four of us made it to fourth street. Showing there was J♠6♠, A♠2♠, K♣6♦, and 8♦2♥ for me. The ace bet 100, the king called, I raised to 200, the other jack called, then the ace raised to 300. The king folded, I put in my last 70 chips, and the other jack called. The ace picked up 2♣ on fifth street, I got 3♣, and the jack got 7♦. The ace’s bet of 200 blew off the jack and we were heads up for the main pot. The final showdown was my J♣8♣8♦2♥3♣2♦A♣ against T♣4♣A♠2♠2♣9♠7♠ and my two pair was good for a pot of 1,415 chips. A few hands later I was all-in with two pair on sixth street, up against a better two pair and an ace-high straight that got there on seventh street. Twenty-three minutes, 39 hands. 2,277th of 2,911 players. Re-buys are just so seductively attractive. I know I shouldn’t do them. Yet here I was at another Final Table tournament, re-buying and adding on even though it would likely be unprofitable unless I won third place or better. Two hours and forty-five minutes. -100% ROI. 21st of 45 entries. Bought into this after I’d busted out of the $1K and chipped up nicely enough before the break with a couple of sneaky straights that I didn’t bother to add on. That was probably just as well, since I busted halfway through the first level after the break. Thirty minutes. -100% ROI. 26th of 28 entries. Got all-in in the first round with the worst of three hands. I wasn’t the only KO. Took me longer to drive there than I played, and I was driving fast. The less said the better. Five minutes. -100% ROI. Somewhere in the twenties, but they were still signing up players. I headed to Encore intending to (try to) get the bitter taste of defeat out of my mouth by getting in their $1K guarantee game, but manager S inveigled me into the Tuesday mixed game which was supposed to have started at 7 but was waiting for someone else to sign up forty-five minutes later. I’m a sucker, I admit it. With six players there was no chance of making a decent ROI, but how often do you get the chance to play 2-7 in Portland? I sat down to the table with S, J—a player I’d mentioned in my write-up of the $10K I won at Encore, and L, both of latter of whom appeared to be at least semi-pros. There were a couple of other guys at at the table as well. Things got off to a bit of a rocky start with the guy on my immediate left who seemed to be getting increasingly upset over trivial matters and ended up storming off to demand his money back after just a few minutes. I did reasonably well in the early stages of the game and managed to outlast two of the players , but bubbled after just about two hours. L had built up a big stack and even through I managed to decent qualifying hands while she was drawing against me, she managed to get there and eventually busted me. I sat and talked to J as they played it out about playing the WSOP Circuit at The Bike in LA next month and the advantages of the Venetian Deep Stack I vs. the LAPC in early February. We’ll have to see how things go, if I get lucky maybe his comments will be relevant. (J eventually won). Two hours. -100% ROI. Third of five players. This was another one of those games where you sort of want to snark at the people giving you poker “advice” that the need to give such advice is a result of a deep sexual insecurity. I drew out on the player to my immediate right twice in quick succession. A hyperactive guy on the far end of the table was predicting doom and gloom on my head. L (see above) was seated at the same table and we were pretty friendly, I thought. She was picking up chips (including some from me). Eventually I shoved with 4♠8♠ on a double-spaded board and a pair of fours with a player ahead of me all-in for considerably less. L called from position and opened up with A♠6♠. I was good until the river when my second pair (8♥) gave L a straight. SH—a regular Encore player—on my left started muttering about how people were “flush-happy”. I pointed out that I had a pair on the flop and straight draw potential—even a back-door straight flush—but that didn’t make him happy and there was general carping all around. Ah, well. I re-bought and continued on. I had to suppress my laughter when, on the last hand before the break, SH shoved everything in from the button and L called him from the BB with a much larger stack. Even if she hadn’t flipped over AxAx, the fact that SH put his stack at risk for the blinds with Ax4x after complaining about my flush draw call was ludicrous. A4o is at best a 3:2 hand against any two cards between 5x and Kx. It’s a 1:2 dog against any pair other than treys or deuces. 85 minutes. -100% ROI. 29th of 34 players. Encore’s doors would be shut Christmas Eve, so they weren’t running their $10K game this week. Aces replaced their Friday night $10K with a $50 buy-in with $500 added for first place. 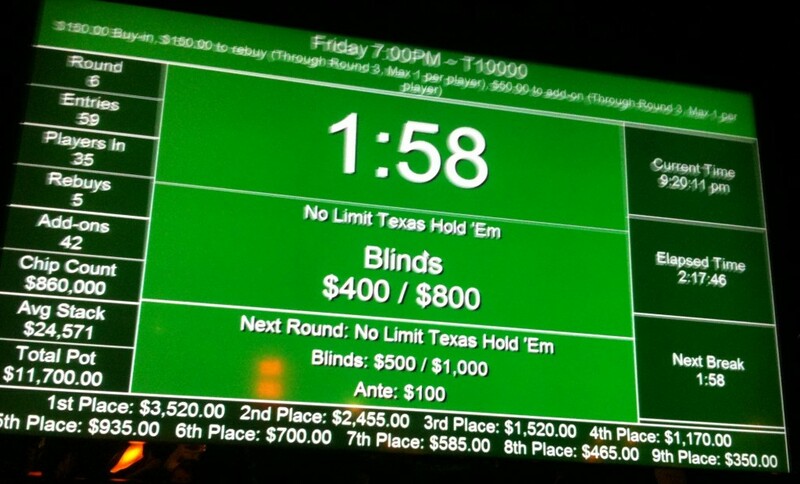 Final Table’s Friday night game was the same buy-in, but with a $5,000 guarantee; instead of $500 for first, they had five $100 bounties on selected players. I had to go for the Final Table guarantee, not so much because I thought there wouldn’t be $5,000 in the pot at Aces, but because I figured the field size would be larger because of the guarantee. I don’t know if I was wrong, but in any case, they were already open to ten tables when I signed up, and the eventual field size was more than 130. I started off the game at the same table I’d played for one of the FT morning $1K Guarantees, with the aggressive M immediately on my right and even more aggressive N two spots to his right. As often is the case M built up a good-sized stack by going over the top from position, but as is almost as often the case when I’ve played with either of them, they both busted out and rebought before the first break and they were gone before the second. I got chopped down in the middle of the first segment, then managed to double up to just over starting stack before break one. By break two, I was at 40K, more than twice the chip average. The third segment was tough. I took a couple of tumbles, doubling up all-ins and getting knocked down to 10,000 chips. A table change brought me into the company of a real peach of a player who seemed to pick one target at each table he was at to denigrate. It didn’t bother me so much—although I did have to check myself a couple of times from making snarky comments—but the woman who was his next target after me was pretty upset. He seemed to get ruder as I stacked back up to 40,000 and picked up one of the $100 bounties. Average at third break was 31,400. Moved into overdrive in the fourth segment and knocked out another player in a race , putting me up to 140,000 (of a total of 1,600,000) chips with 25 players left. Six-and-a-half hours after we started, we were in the money (17th got a bubble payment of $100). AN hour later we made the final table with ten players. I’d made a big misstep not long before the final table. I was in the SB with A on my left. 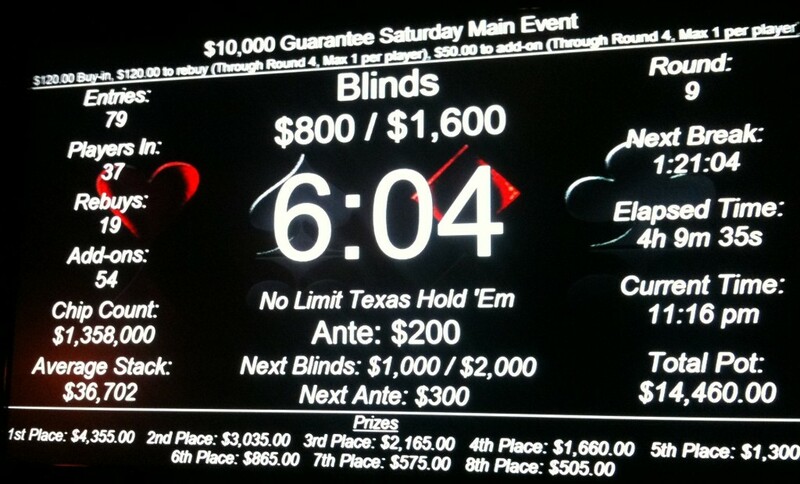 I had KxTx and raised to 16,000 at 4,000/8,000/500 after action folded to me. She called and the flop came Ax7xAx. I checked and she bet at it, the board eventually had Ax7xAx7x9x and there was 50,000 of my chips in the pot. I didn’t think she had the ace and thought I might have the best kicker but…. 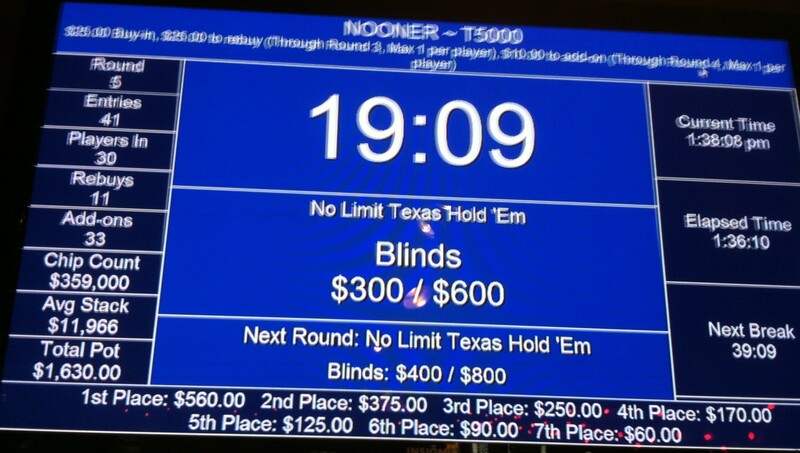 Blinds were eating through the stacks at the final table. A number of people were pressuring the big stack to make a chop; I gave him my advice to fight to the end. I was down to 51,000 chips with blinds at 10,000/20,000/3,000. Definitely the short stack at the table at that point. I picked up KxTx again and shoved from UTG+2 and almost got away with it. Action folded to BB, who thought about it for a long time, then called me with 5x7x. She had a 33% of winning and managed to hit it, pulling out a nine-high straight. A little birdie tells me that it went on for a little longer after I left, then they chopped it for what would have been just over $1,000 each. Eight hours. +143% ROI. 10th of 131 players. Tournament re-buys are the death of your ROI. No matter how bad the beat you took, no matter how much you think you could win it if you were back in the game, regular resort to re-buys or re-entries—whatever they’re called and however they’re structured—will guarantee most players are losing money. 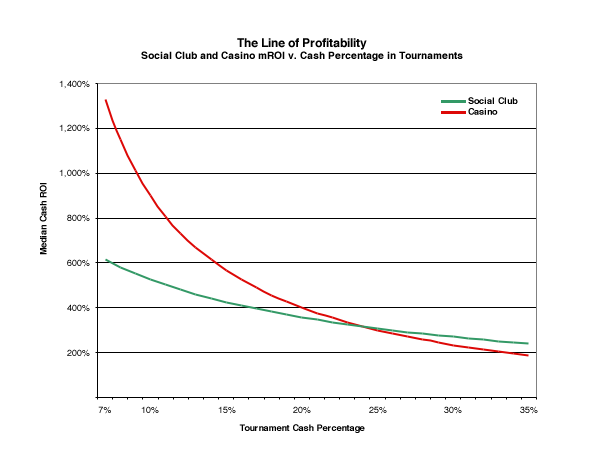 I keep a particular eye on two of my own statistics: in the money (ITM) rate and median tournament cash ROI (mROI). The first is easy to calculate, it’s just the percentage of times you cash in tournaments: if you’ve cashed in 16 out of 75 tournaments, then your ITM is a very decent 21%. Looking at the top recent tournament players with long records from Carbon Poker, PokerStars, and PartyPoker (as ranked by Official Poker Rankings), their ITM is between 10% and 20%. The top ten players in PokerStars’ $10,300 buy-in event on 18 December had a total of 56,000 games tracked between them; their ITMs were in a very narrow 13% to 17% range, meaning they cashed in every sixth, seventh, or eighth tournament, on the average. The mROI is a bit more difficult to calculate, because you can’t just keep a tally of wins and cashes, you need to figure the ROI for each cash and keep a list of the ROIs for every game. (My own process is automated.) Now, you could find the mean average by adding all your ROI values and dividing by the number of cashes, but I prefer the median because it prevents the ROI from a big cash from distorting what your usual take is. I calculate ROI by adding all of my expenses: door fee (in social clubs), buy-ins, re-buys, add-ons, and tips. So say you play a $25 game with a $10 door and an add-on of $10. That’s $45. You win a pot of $200 and pay $20 for a tip. Your cost is $65. The ROI is going to be your profit ($135) divided by the cost, or 208%. If you bubbled the same tournament, got $25, and paid $5 to the dealer (because you’re a nice poker player), your expenses would be $50 and your ROI would be -50%. Simple math. The “middle” of the sequence is between “4” and “5”, so the median value is the average of those two numbers: 4.5. And since there are eight values, the median is the average of 134+225, or 180 (rounded up). How does this tell me anything about re-buys and profitability? The other thing to keep in mind in this discussion is that these are measures of overall tournament performance. Obviously, if you mostly play smaller games then try your hand at a large tourney and hit big, your overall dollar ROI is going to be great—it’s exactly what I was trying to do with the attempt on the Venetian Deep Stack Main Event last month—it’s just that you can’t count on that happening. The comparison of ITM and mROI provides a gauge of profitability that controls for variations in tournament structures, field sizes, and other factors that change between games and venues. How well do I have to do? Let’s start with a player with a respectable ITM of 17%. As explained above, that player needs an mROI of 400% to break even; better to be profitable. That means taking down a prize that’s five times the amount of the combined cost to enter the tournament (plus tip). As we’ll see, that’s difficult enough to to in a large tournament, and almost impossible in a small one. Example 1. 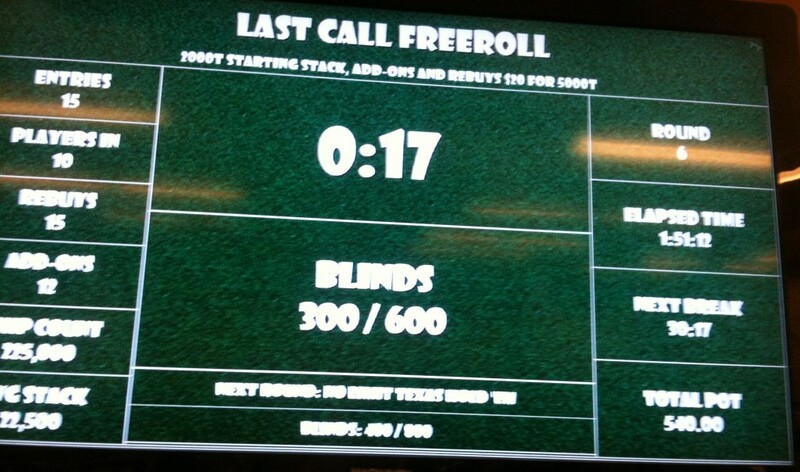 Let’s look at the stats from a recent late-night turbo game with just eight players. 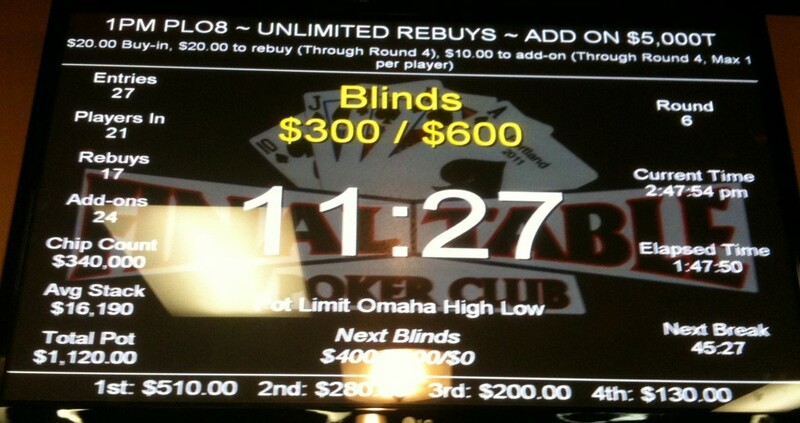 Door fee was $10, buy-in was $25, there was one re-buy allowed and no add-on. Three re-buys in the tournament put the prize pool up to $275 and the bubble was paid, so payouts were $175, $75, and $25. Minimum expenditure before tip was $35 (although it would be less if the player spread his door fee costs out over more than one tournament on that day). If the player who won top prize paid an $18 tip, their ROI for the game would be 230%, well below the mROI for a player with 17% ITM. A game that small isn’t profitable unless you’re winning—not just cashing, but winning—more than 25% of the time. If you’ve re-bought, your cost (including tip) is $78, your ROI drops to just 124% and you need to win 40% of these games to break even. Minimum pre-tip expenditure in this game is $130, but more than two-thirds of the players bought the add-on, so we’ll consider the standard to be $180. Here’s a table comparing ROI for players who pay only the buy-in, the buy-in and add-on, and those who re-buy and add-on (all are considered to tip 10%). Even in what is decent-sized field (by Portland standards), just making the money can’t make you profitable. The lowest break-even point for a player with 17% ITM is fifth place in a field of nearly 100 combined buy-ins and re-buys if they don’t do an add-on. With the add-on, it’s third place. The median payout for both of these players is 430% and 328%, respectively (between the 4th- and 5th-place payouts). If the player is cashing in one-sixth of these events with just a buy-in, then they’re statistically likely to be above the break-even point over time. A 17% ITM player with an add-on has to make the top six spots regularly to maintain the 400% mROI. The re-buying player, on the other hand, can’t afford to just cash one-sixth of the time in events like this. They need to place consistently in the top 3 positions in order for their mROI to maintain at 400% or above. For players with an ITM of 13%—cashing in one out of eight games—the bar is necessarily higher. The players who don’t re-buy are still in decent shape: a buy-in only player is probably making less money but still profitable if they can make the top 7 payout spots when they cash. A player who gets the add-on needs to place in the top four spots to maintain profitability. But break-even mROI (470%) for a player who regularly re-buys means first place and first place only. Anything less is just throwing money away over the long run. As I mentioned earlier, the mROI needed to play events like these is higher than it is for social gaming clubs. It’s a little counterintuitive, but in casino events you’re paying your rake and something for the dealers (in most instances) as a part of your entry fee. In Portland’s social clubs, only the winners typically pay the dealers, and the size of the tip is much larger in proportion to the prize money. To break even, what’s left over needs to cover the buy-in costs of future games that are lost, which is why the mROI needed for casino tournaments is greater. The graphic above shows how the inclusion of a 10% tip into the ROI calculation for a prize affects the profitable mROI value. In the casino prize, the calculation is straightforward: if you win one in six games, your average prize needs to be able to pay for five games in which you lose the buy-in to stay even. If a tip is taken off the top of the prize money, however, all six buy-ins (including the return of the game you win) need to come out of the other 90% of the prize. Large events generally pay a smaller percentage of the total prize pool to the winner, but the size of the field inflates the prize pool enough that this tournament—with fewer than three times the number of buy-ins as Example 2 and no add-ons—still has a first prize:buy-in ratio 50% larger. The ROI is nearly 10 times larger (even when Example 2’s tip is ignored, the ROI for a buy-in only player is 3,529%, still significantly under the top ROI for Example 3). That said, the prizes on the bottom end tend to be flattened out in their structure, with the minimum cashes making money—in this case—just over 2.5 times the buy-in. That flat distribution on the bottom end means the median ROI for cashing in the tournament is just 287%, well short of the 500% needed for profitability with an ITM of 17%. You need to regularly make the last two tables (top 7% of entries) to make games of this size profitable over the long run. Example 4. An event like the WSOP Main Event has twenty-five times as many entries as something like the DSE Main Event. Pius Heinz’s first prize ROI was a whopping 87,053%. Down on the bottom end, John George in 693rd place (and the other 71 players who got the same amount) had an ROI of just 94%; that’s not enough to cover a single lost buy-in. The median ROI for all players cashing in the 2011 WSOP-ME was 255%; you needed to make it into the top 200 spots (3% of the field) before you were likely to be maintaining the 500% mROI needed for profitability with a 17% ITM (or the top 180 with an ITM of 13%). Events this size are an outlier in the data set, but many of the other WSOP events get several thousand entrants as well, and the payout structure is very similar across the series. What Does It Mean (Or Median)? Calculate your ITM percentage by dividing your number of cashes by the number of tournaments played then multiply that by 100. For each tournament in which you cashed, calculate the ROI percentage. Subtract the total cost of the tournament from the prize money to determine the profit. Divide the profit by the total cost of the tournament. Sort the ROI percentages for your cashes in numerical order, then find the median value (see explanation above). You’ve now found your mROI. If you’re above the line (depending on the type of games you play) then you’re probably going to be profitable in the long run. This is a measure of average performance over time; individual circumstances differ. Taking down a first-place prize in a large game is the goal of any tournament poker player, and it doesn’t matter one bit what kind of an ITM Pius Heinz has now that he’s won the WSOP-ME. Getting there is a different story. There’s no way to be a middling, profitable tournament player. Unless you’re exceptional or lucky, you’re probably going to lose. How fast and how much is the question. The re-buy just makes it that much faster. A very appealing tournament, with the house adding $200 to first place. How can you not afford to play it? I came in hot a few hands into the game with 4x9x making a straight and taking a couple thousand off of one of the players at the other end of the table. Then I lost it all on the next hand hitting top pair on a Qx6x4x board when I ran into QxQx. I re-bought just as JB sat down on my right in the #1 seat. As more players arrived, I was moved to an expansion table and settled into my normal rhythm of ups and downs. I had about twice the average stack of 8,000 at the first break, then added on for another 5,000. Post-break, post re-buys, I was slipping and down to around 12,500 when I picked up TxTx as BB and pushed over the top of a large pre-flop raise by SB. It was a race between my tens and his AxJx and he caught it on the river to knock me out. Three hours and twenty-five minutes. -100% ROI. 24th of 38 players. Juarez. Double-flop, double-turn, single-river Pot Limit Omaha 8OB. Double-Barreled Shotgun. Limit 5-Card Draw with betting rounds after the third, fourth, and fifth cards are dealt, after the draw, and after each player-selected card is exposed. That last comes out of Poker: The Nation’s Most Fascinating Card Game, published in 1950 by The United States Playing Card Company of Cincinnati. Sometimes my instincts fail me, sometimes they work out OK. The last Encore $10K for the year, they failed me in the wrong spots and with the wrong people more often than they steered me the right direction. On the plus side, shortly before the first break, I managed to get my stack back up to a respectable size by calling down a guy on my right who was betting into me while I held fourth pair on the board with a king kicker. But the reason I was down to 5,000 in the first place was that I’d gotten myself over-extended with a similar hand against one of the hotheads from a previous game. I managed to tread water for several more hours, always closing in on the average stack if not quite reaching it, then I made the fatal misstep that put me out. I had JxTx and the older gentleman on my right had something he liked. The flop was Jx7x7x and we got all-in, then he flipped his aces and I was busted exactly halfway through the field. I didn’t need to go all the way with that one. Still, one bright spot came out of the game. The entire final table chopped the money for the first nine places, which came to $1,579 each and means Poker Mutant keeps the self-appointed crown for largest prize in a $10K event in Portland since Encore went to weekly games in October through the end of the year, because they’re on a holiday schedule the next two weeks. Four hours. -100% ROI. 38th of 79 players. 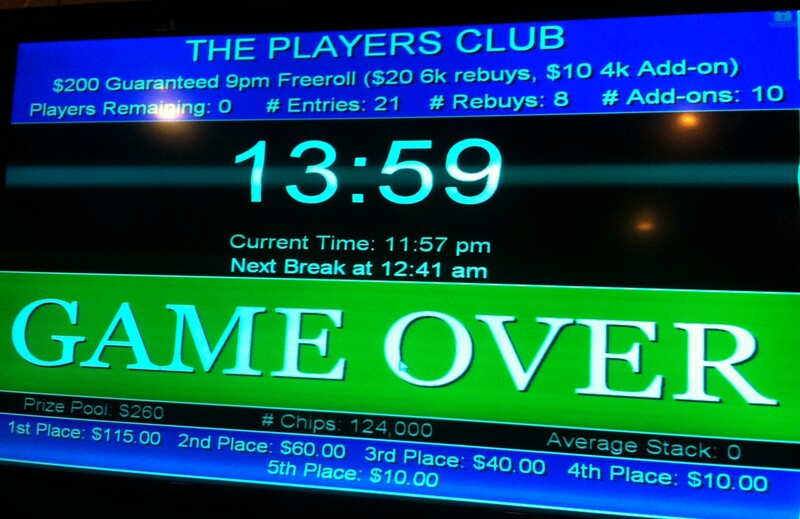 By the first break in this game, I had one-sixth of the chips in play, with three tables still running. That slipped a bit, but by the time the final table was made, my portion was back up: to half of all the chips. You’d think that with an advantage like that at nine players I could pull out something better than a third-place finish, but an over-reliance on small pairs seems to be killing my end strategy. Something to correct. Three-and-a-half hours. +225% ROI. 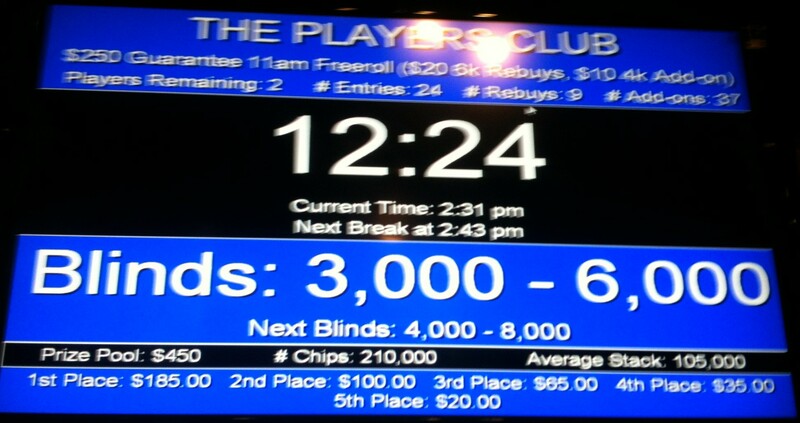 3rd of 24 players. This could have gone so much better. 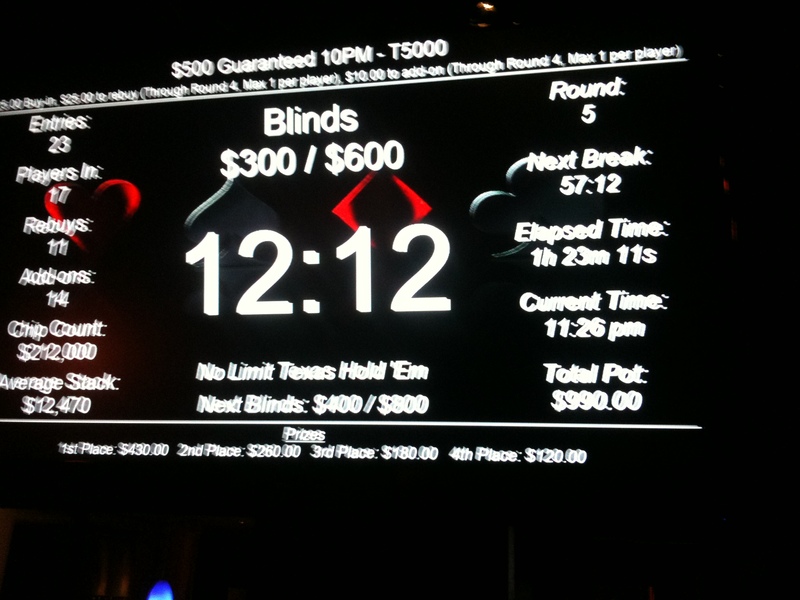 I was seat 4, up about 1,000 chips in BB holding [td th] in the first level of the game. A couple of players limped, seat 9–who’d just rebought the previous hand–raised, then seat 1, who’d been hit hard, went all-in for about 1,800. Action folded to me and I shoved, getting a call (for less) from 9. 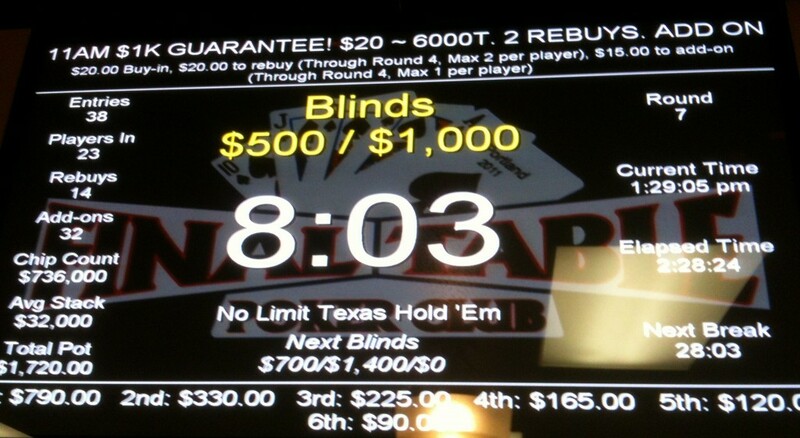 Seat 9 flipped 9♦9♥ and groaned when he saw my higher pair. The rebuy stack showed A♦K♦. I was in he lead with the best hand, but not favored to win, and two aces on the flop with a king on the river for the best-possible full house solidified my position. I busted out, rebought, and busted again to be the first man out. Thirty-five minutes. -100% ROI. 34th of 34 players. I had another engagement on Saturday evening, so I decided to take another crack at the Aces $10K, so I started off the day at their noon game, which always seems busy. Nothing spectacular happened, I didn’t rebuy, I made it to the break and added-on, but I didn’t make it far beyond there. Ninety-five minutes. -100% ROI. 30th of 41 players. It’s not my first choice: despite the higher buy-in, the overall pots are smaller due to smaller fields. I made a couple of big mistakes. One was letting myself get bluffed off a large early pot with one player all-in and two of us calling when I was holding KxTx with the king paired and a jack draw to Broadway. 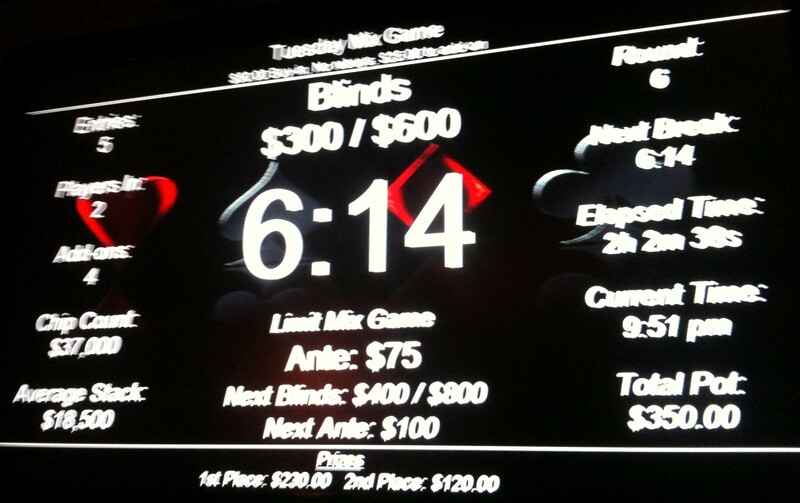 There was a flush possibility on the board, an ace, and I folded to a raise to 3,600 on the turn. The winner at showdown had just Kx5x for a pair of kings. Near the end of my time in the tournament, I raised from BTN with AxQx, then folded to a bet on the king and rags flop, only to see an ace and queen on the turn and river. I still haven’t even come close to cashing in the Aces $10K. Two hours and fifteen minutes. -100% ROI. 35th of 59 players. Nine years ago on December 12th the Poker Mutant just about died from complications brought about by a broken leg a couple months before, if you can believe that. According to the doctors, he beat the odds then. Now he plays the long shots in poker. Didn’t even make it out of “H”. My KxTx Broadway straight managed to beat trip queens but fell to an ace-high heart flush completed by 6♥8♥ in the third player’s hand. Four minutes, seven hands. 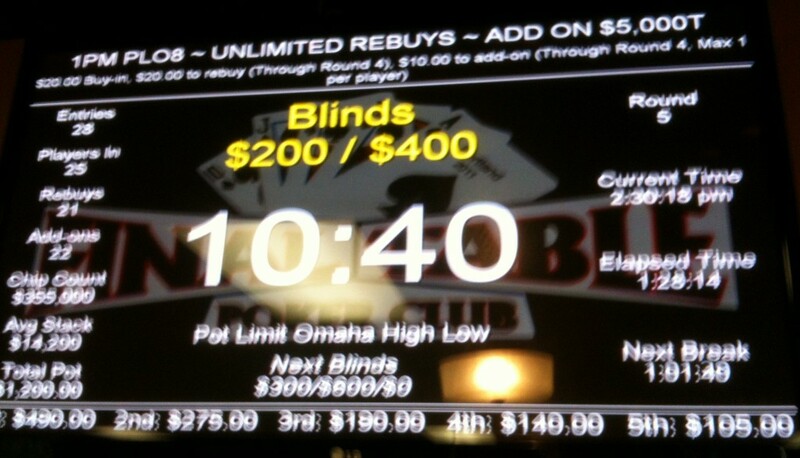 2,623rd of 2,626 entries. 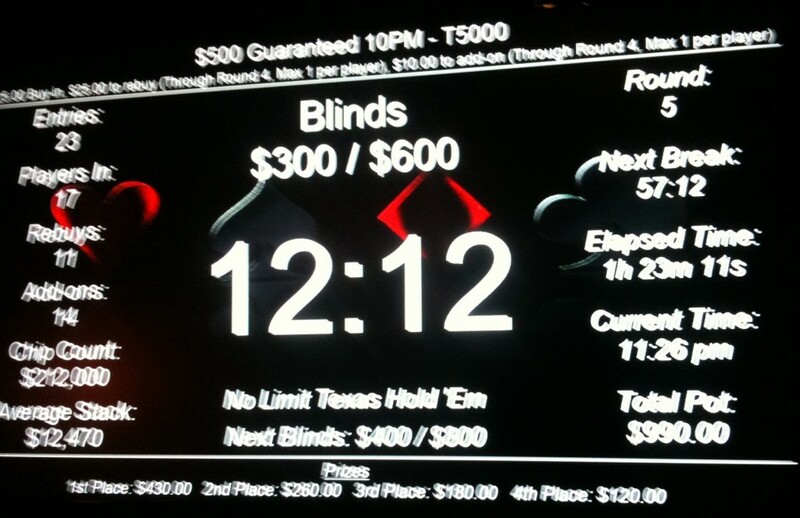 Had some success early on, then was the short stack by the time we got to the final table. Some luck kicked in there, though, and I started pulling in chips as the first couple of players fell away. Then I got into a tussle with one of the big stacks and got caught up short. Two hours and fifteen minutes. -100% ROI. 7th of 24 players. A brutal night on the home turf. Lost my first stack to WA in record time when he pulled out a better kicker on the same set I had, then lost the next stack to him in much the same way only his better set kicker turned into a full house. Forty minutes. -100% ROI. 7th of 7 players. 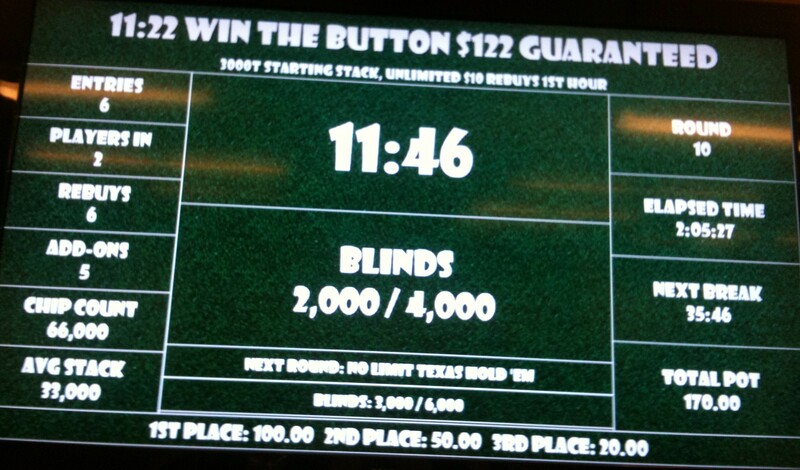 I’d been thinking that if the puffmammy game got over soon enough, I’d head over to Deuces for another Win the Button tournament, but we were done before 10 and since I’d already paid my door fee at PPC in the morning (only $5 for the early game) I zoomed over there as fast as I could. I was just before the first break, and CB took my money for both the add-ons, so I sat down with 8,000 chips. I got to the table for just a single hand, which I didn’t play. Things went fairly well from there. The freerollers who hadn’t done well and hadn’t added-on were getting knocked out. With 8K in chips, I was actually starting off above the chip average and there were a couple of loose players at the table. 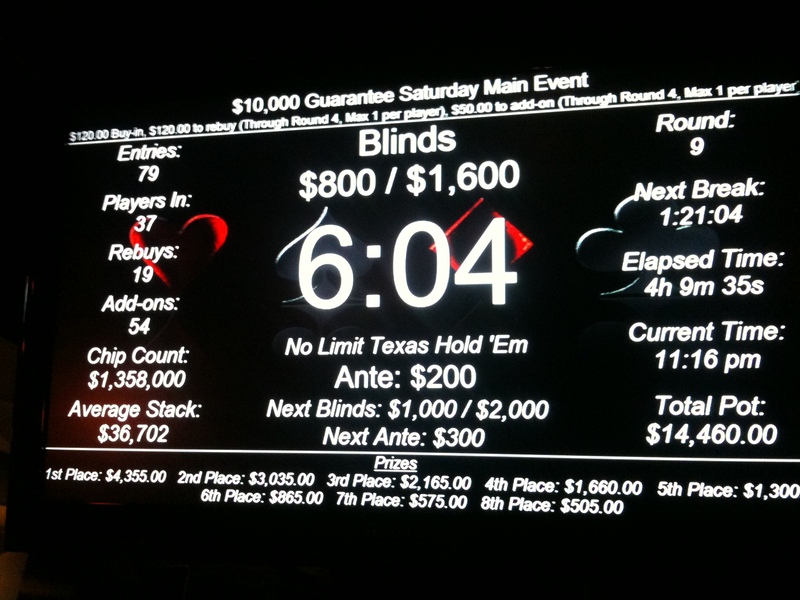 Play went pretty fast and we made the final table in what seemed like record time. Then again, I hadn’t played the first hour of the tournament. Eventually it was just me and C—one of the PPC regulars—and we agreed to chop it. I had about a 7:5 lead but we did it evenly, after we’d agreed to reserve a cut for the dealer and paid nominal money to fourth and fifth places, the amount of money wasn’t exactly earth-shattering. But for me it made up for the ugly puffmammy loss. One hour and forty-five minutes. +340% ROI (even chop of first two prizes). 1st of 21 players. 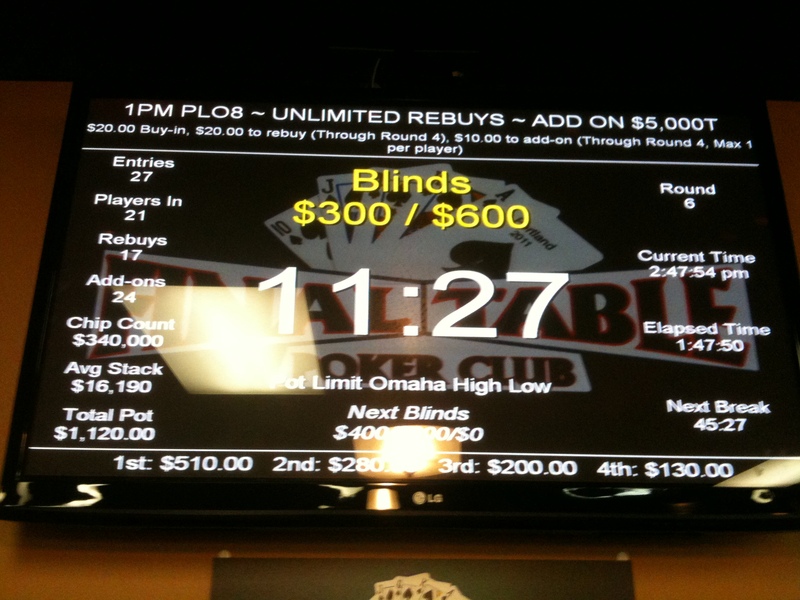 I’d been itching for an Omaha tournament for a while and finally headed out to The Final Table for a scratch. Ran into Encore manager SG while I was signing up and mentioned that I liked FT’s receipt system. The tourney started off incredibly well for me. In the first round there were three post-flop all-ins ahead of me. I had K♦ with a suited kicker and there were two diamonds on the flop, including A♦. Too much money in the pot not to call. I made the flush on the river and took in a pot of nearly 20,000 chips. My count went steadily down from there, though, and soon enough, I was forced to re-buy. Then that stack started to dwindle away, and by the first break I was down to about 1,800 chips, dwarfed by the 5,000 chip add-on (if that hadn’t been a single chip). Finally, I started to turn things back around and swiftly built up over the chip average, but all it took to get busted out was a missed straight and flush to knock me out again. One hour and forty-five minutes. -100% ROI. 22nd of 27 players. The Poker Mutant’s hanging on to the biggest $10K pot for another week. The Road to Prague came to an abrupt end in Vegas a couple of weeks back, so instead of testing the waters at Day 1B of the European Poker Tour in the Czech Republic, I played a lot of poker here in town. Hadn’t been out to D’s place for a couple of sessions, but action was already started with me only a few minutes late. Jumped right in and did surprisingly well, particularly off a game of ‘Big O’ five-card Omaha. I was up over two buy-ins in profit then it was an evil downhill slope where I lost my profit, my buy-in, and two more buy-ins before I managed to recover a little. I hadn’t been into Deuces since the inaugural tournament back in July. It was pretty quiet just after midnight when I got there after leaving D’s, with four people sitting around one table playing spades when I was expecting to walk into the last minutes of the first round of their 11:22pm Win the Button tournament (which I’d been interested in trying out). There hadn’t been enough players to start the tournament—and even with me they still had to wait for another—so I hung out a little bit to see if it would get off the ground. After about ten minutes GG walked through the door and we got down to business. I hadn’t played a Win the Button tournament before, but there’s certainly an extra dimension of strategy involved, even in folding. The winner of the hand gets the dealer button moved in front of them for the next hand, and while some versions of the game rotate the blinds and just give the button player last action, at Deuces the blinds are fixed to the button as in a regular game, so consecutive wins by the same player really punish the positions to his immediate left, especially once the blinds get up there. Early in the game I was on the BB with 7♠2♠ and called a 5x raise pre-flop to pair the deuce. Another deuce hit on the turn and I kept calling. A 7x on the river made my full house but I wasn’t abel to get any more money out of them. I flipped over the hand and was the object of much derision for the rest of the game, with some mentions that I should read the copies of Super System in the lounge area. I sort of had to laugh. I eventually ended up re-buying and doing an add-on, but several other re-buys worth of chips at the other end of the table seemed to be taking the day by the time I was out. 90 minutes. -100% ROI. Placed 4th of 5. Worked for a while on my birthday morning, then headed off to the Encore. This is one of those times when I really wish I was keeping better track of my play, but it was my birthday and I was playing mostly for fun. I’d been knocked down a bit and thought I was going to double up with KxKx against an ace-high hand, but the board put out four spades and with his A♠ he knocked me out. I got my re-buy stack (first in the tournament) and a newly-sat player on my right pushed on the next hand. I called him with TxTx and he flipped 9x9x. My barely-higher pair held and I was up to 10,000. That sank to about 7,400 by the first break. I picked up the 3,000 chip add-on, along with another 21 of the remaining 28 remaining players. 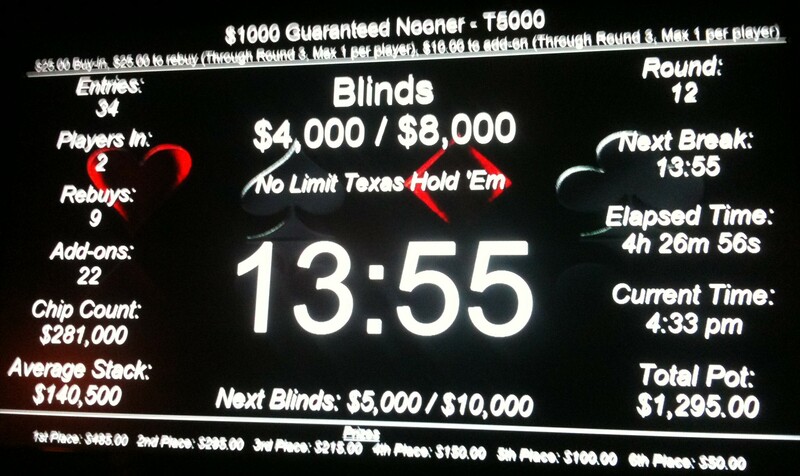 Not long after the break ended, I got another pair handed to me and pushed up to 17,100 with JxJx against 9x9x. 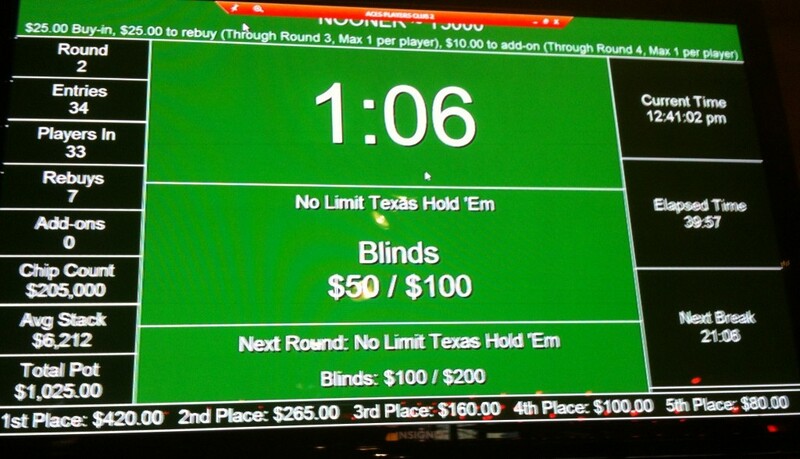 With no action ahead of me, I raised from from BTN with QxTx and got an all-in from BB. I called and he showed 5x9x. I made an unnecessary set of tens. On my last hand before the break I ended up all-in with AxAx against Ax9x and hit a full house by the river. That put me up to and even 30,000 chips at the second break, with 15 players left and a little more than 10% of the chips in play. That’s where I stopped recording regularly. Three hours into the game, I was at 68,000, then back down to 60,000 (with the chip average under 32,000) when we made the final table. 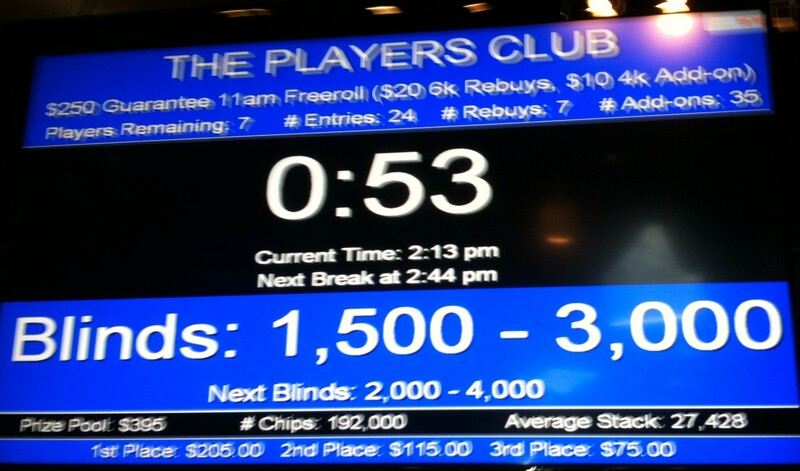 At the four-hour mark I had 131,000 chip, and was over 50% of the chips in play by the time we got to 3-way play. Every hand I was getting had some sort of ace in it, and I was putting the two other stacks at risk continuously. They were talking about how they were playing for second and third at that point, I was prepared to make a deal of some sort, then I shoved with 2x2x—the hand I’d won with in the $10K—and the larger of the two stacks decided he’d had enough and called. I don’t remember what he had, but he had enough chips that when he hit a better hand by the river, his stack was larger than mine. That caused me problems on the next hand when I shoved with 3x3x and got called again, because then I was out, with less than half the money I could have won from some smarter play. Four-and-a-half hours. +134% ROI (including tip). Placed 3rd of 34. Aside from the re-buy, I broke my other cardinal rule and had a drink (on the house, courtesy of S) while was playing. Hell, it was my birthday, I had two drinks. Busted out shortly after the first break. Eighty minutes. -100% ROI. 17th of 23 players. Wandered back across the river to Deuces and made it possible for the Win the Button game to get going. PO—who used to run mixed games elsewhere—was behind the desk and it was good to see him again. My second run at this game went considerably better. By the time it was down to just GG and myself, I had him at a bit of a disadvantage, and this time there wasn’t much joking about my need to brush up on Brunson, especially with me winning the button 80% of the time and a small blind representing 3% of the chips in play. I was magnanimous. It was late, the 2:22 game was due to start in fifteen minutes, and there wasn’t that much money at stake. We chopped evenly. Two hours. +53% ROI. 1st of 6 players. I thought this game was going to go a lot differently. Not long after we got going, a player sat in seat 9 and started blowing through buy-ins. He was all-in on his first hand and it seemed like his only move was all-in. Inevitably, he’d get called and while he did win a couple showdowns, it wasn’t because he had the best hand to start. Or even a good hand. Anyway, some large stacks got made at our table because of it. I picked up quite a few and was doing well until after the final table was made, then tangled a couple of times with other big stacks and got cut down. Deuces has been trying to run a 24-hour operation, but later in the day after I was there the web site changed to say they were only going to be open late-night from 11pm to 7am. I wish them (and everyone else in the Portland poker scene) luck with that. One hundred ten minutes. -100% ROI. 9th of 15 players.